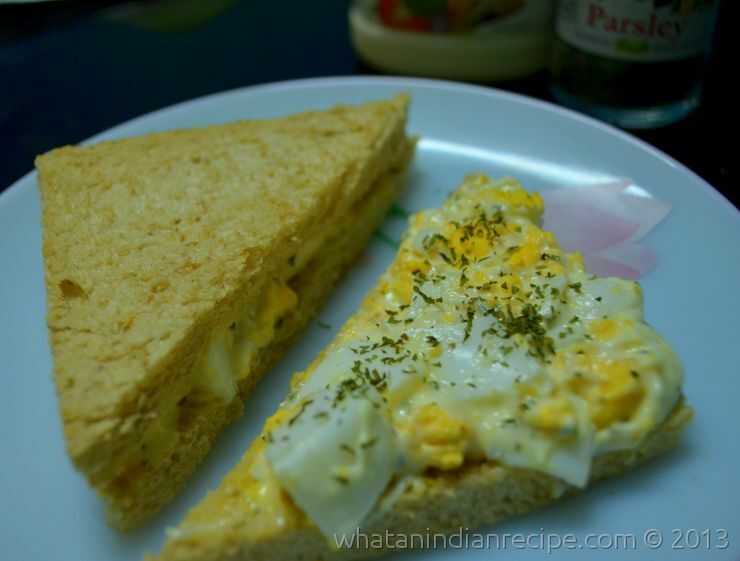 Easy Egg Sandwich is literally the easiest of all sandwich recipes, helps you grab a quick breakfast or snack which is filling & healthy as well.I haven’t used much ingredients here, but you can always experiment, like adding chopped capsicum, olives, lettuce and probably a pinch of pepper powder, to suit your taste and time at hand. Cut the sandwich bread slices diagonally for form 2 triangle shaped pieces out of each slice. Toast both sides of the bread slices lightly. De-shell the hard boiled eggs and cut them into medium sized pieces. Take a bowl mix mayonnaise, parsley & egg pieces. Take each triangle slice and apply the mix on to it, optionally you may sprinkle some parsley or pepper powder over it, and then cover it with another triangle piece to form a sandwich. Repeat the process for all the other bread pieces. Enjoy it with tomato ketchup.